A friend was recently visiting me while I was making some jewelry. She noticed my inexpensive hand tools and asked me why I wasn't using more expensive/professional grade hand tools instead of the thrifty "economy" versions that I was using. Some of my favorite and most used hand tools – and even some of those I use in my books – are inexpensive chain nose pliers, round nose pliers, and end cutters. I guess I never really thought too much about it. I've always just been busy creating. It's true that you can buy expensive tools such as pricey pliers that are a bit more comfortable to use because they're more ergonomically correct, which I'm sure would be beneficial if you're doing a lot of repetitive work - but I don't do that type of work so I guess I just never really had the need. I've always been pretty happy with what I have, and never saw the need for buying anything else. I've actually always thought of my hands as my tools, and any pliers or anything else that I used - as just extensions of me. It's not the tool that creates the artwork. It's the magic of the person behind the tool. It's their mind and their hands, it's their creativity, imagination, and innovation. 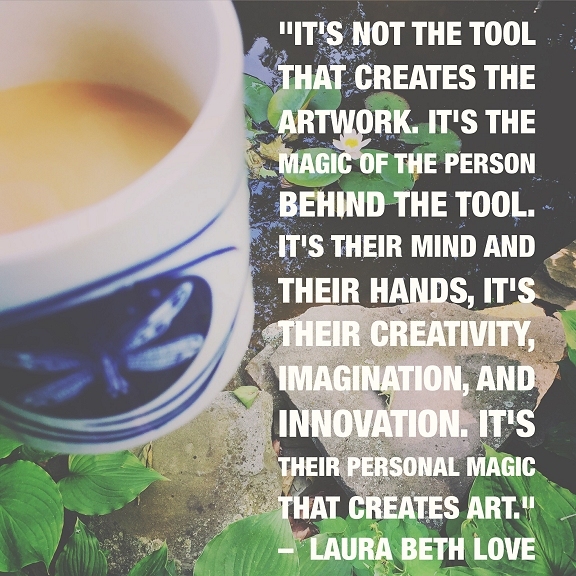 It's their personal magic that creates art. I recently received an email from a fan in Italy who sent me a photo of herself working making jewelry from broken china plates using techniques that she learned from my book, Boho Chic Jewelry. She thanked me for writing my books and for sharing my secrets so that she (and other people) could make jewelry like mine. She said that she didn't have the money to buy some of the tools that I recommended in my book but that she was improvising and using what she had (cruder hand tools) until she could afford to buy some of the tools that I recommended that would make her work easier. With her email she included photos of some of the jewelry that she made, which was beautiful. In reading her letter and seeing the photos of what she had created, it was clear to me that she had the understanding and the magic because of her motivation and innovation, which was apparent in her jewelry. Understand that everything you need is already inside of you. 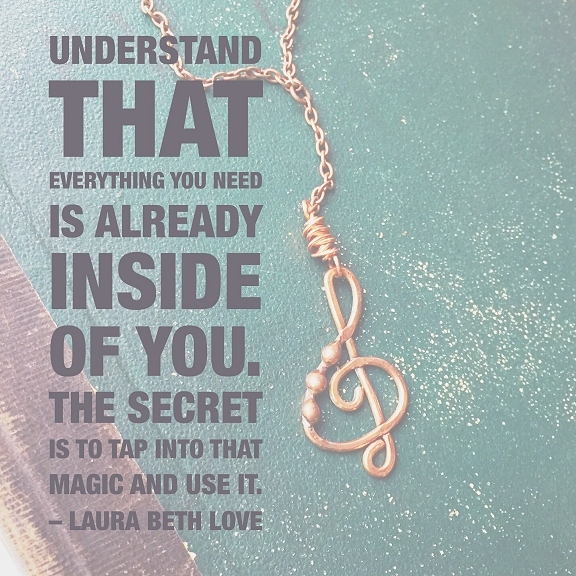 The secret is to tap into that magic and use it. In my books Boho Chic Jewelry and Soldered Alchemy, I suggest what tools are optimal to help you create jewelry. But please understand that YOU are the one ultimately making the jewelry, not the tools! Some synonyms for tools are: utensil, instrument, apparatus, gadget, device... but please realize that you, your hands, and your imagination are the biggest, most important tools that you have! Understand this: There are many tools available that can help you work faster and maybe more efficiently, but there is no tool in the universe that will help you work with a higher level of creativity or motivation. Make creativity your daily practice and make this practice a way of life, instead of thinking about what particular tool, apparatus, instrument, utensil or gadget you need to buy, because all of that is secondary. Tools are merely the instruments of you. Are they helpful? Are they essential? Of course they are. They help you do certain tasks that are impossible to do with bare hands. But my point is this: Focus on innovation, on having a different perspective, and on being creative, because that is the secret to creating beauty. What do you think? I'd love to hear your voice so please leave me a comment below. I love your philosophy! You're my kind of gal! It's true! I make greeting cards. When I started out, I had few tools. I used an Exacto knife to cut my paper. Now, I have a guillotine cutter and a die cut machine. It makes a difference as to how much I get done, but putting the colors together and designing the cards is all me! Thank you for sharing your perspective! This is a great post, Laura. This is what photographers are often up against, as well. "What kind of camera made that wonderful shot? "...Having top of the line equipment is wonderful, if you can afford it. But, a gifted person can make something beautiful no matter how "bottom of the line" their tools are. Plus, expensive equipment is no guarantee that something beautiful is going to come out on the other side. I could take a severely lacking photograph just as easily with a Hasselblad as I could with a Polaroid. 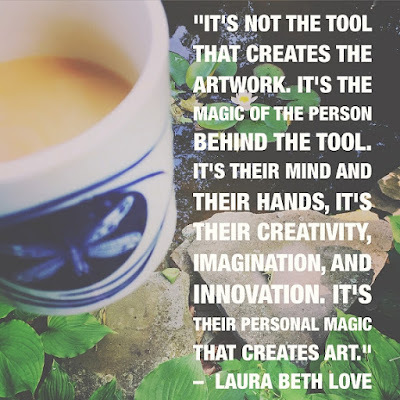 Thank you for letting people know that it is we who create the art, not the tools that we use. Have a blessed day! Yes! You already have everything you need. We often hold ourselves back because we think we don't have the right tools or gadgets. The truth is, when you are ready to let your art pour from your heart - there's no stopping you. That's exactly right. Thanks for visiting! I use a regular old sewing machine, even though I sew professionally. My customers appreciate the design and craftmanship more than the tools I use to make my items :) Great post! Last night, I went to your Etsy shop and was just blown away with how beautiful your creations are. Lovely, lovely creative work. You create a wonderful blog full of inspiration and beauty. Thank you for feeding our creative souls. Have to chuckle. Below the comments on this excellent essay I see ads for jewelry making tools ranging up to $415. dollars. It could be that 400 bucks is small change these days. Not for me. No doubt you didn't chose those items for sale...... so here's an example of why some people think they really do NEED these tools in order to start making jewelry. Better they read your essay and use what's at hand til they are sure they have what it takes in the creativity department. Thanks for writing this. This is great, and rings so true! I'm a letterpress printer, and many of my letterpress peers are weighed down with all of the masses of tools and equipment that accumulates. It's easy to hoard when the tools are rare and the equipment is not made anymore. But I've been doing the opposite, and actually clearing out tools that I never use. I've found that there are about four or five tools I routinely grab, and three of those are things you can buy at any hardware store. I recently came across a facebook post from another metalsmith who reminds other smiths that you can sometimes make your own tools too! Very true! And jewelry folk are the same way when it comes to beads and gems - we tend to buy too much and hoard them and so many never get used! Which leads to my next blog post...Lol Have a great week! Beautiful quote! I agree 100%! Some of my favorite super-talented illustrators get asked what tools they use and it's just regular pencils. It's their imagination and talent making the amazing art, buying exactly what they have won't substitute for the hard work and practice. This quote is a good reminder too of just letting loose and being ourselves in our expressions for the best results. It's something I struggle with. Yes, practice is a big one! I think that especially when it comes to a particular technique (like in my own case, the soldering I do) practice is paramount - and along with that comes patience, persistence, the list goes on...(that's another blog post in itself! haha) And you're right about letting loose and being yourself - well put! I think we all struggle with that from time to time. I fully agree with you - it is the inside what matters. You have to have the vision; you have to have something you want to share out; if you only have expensive tools, it will not work. Photography is a very obvious example. People keep asking me what camera I used to take some of the better photos and they are always surprised to learn it is an inexpensive DSLR. That camera is enough for my needs. The thing is I must SEE something I want to take a photo of. Of course, the camera must be good enough not to ruin the shot, but it does not have to cost several thousand dollars for that. Exactly. We have to know ourselves first and foremost - before knowing any tools or equipment - those are just accessories...ways or tools of expression. But the expression itself comes from inside of us. I appreciate this because when I read it, I'd like to think it's talking about people like me. That it's OK to just be creative and make it happen even if you aren't experienced in any one thing (which I am not ;) Thanks!